I know you don't see many top notch Olympic athletes compete in a skirt and flip flops, but hey this is the backyard kind! 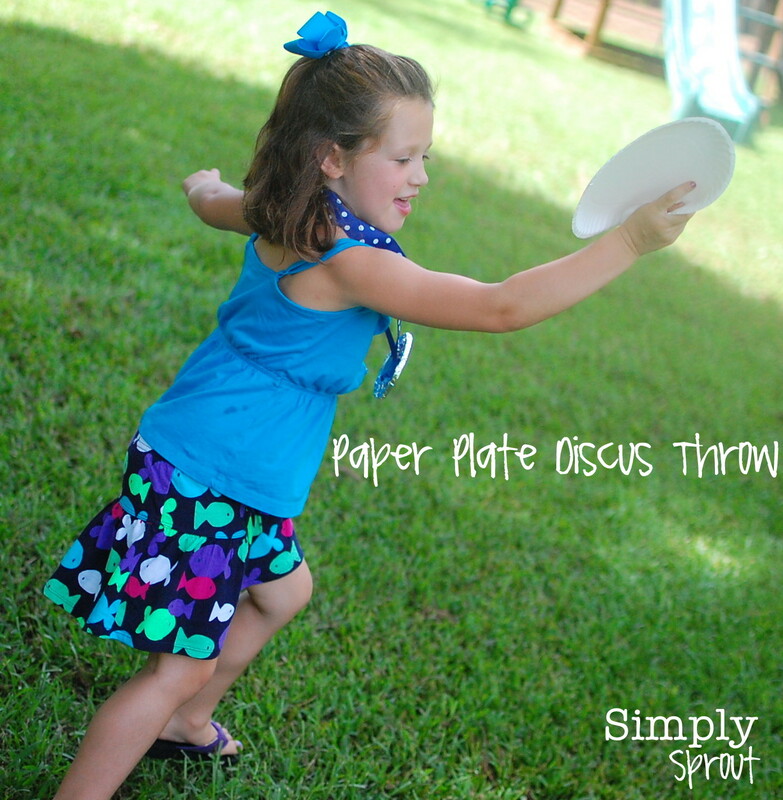 After reading and talking about different sports that were once in the Olympics, and some that we'll see in the next couple of weeks, we started with the Paper Plate Discus Throw. 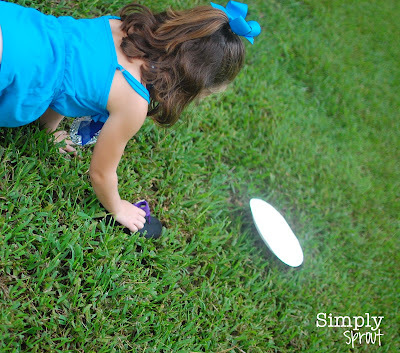 If you haven't tried it before, paper plates aren't the easiest to throw. This made for a great mini science lesson on air resistance. My niece tried a couple of different methods until she found one she liked. Now it was time to measure the distance to where the discus landed. Since she is just heading into kindergarten it was best to use a non-standard type of measurement. I let her choose what to use, and her tool of choice was her flip flop (knew they would come in handy!). It's important to have children estimate first, and then find the actual measurement. We found some old party hats around the house, and thought we could make use of them. This is a great way to practice hand eye coordination. Grab a small ball (ping pong type would work well, we used a plastic golf ball) and let the kids toss it back and forth to one another trying to catch it with their cone. Once they get the hang of it they can use their cone to toss the ball to one another. Preschool/Early Elementary: Have children choose several items to use for their non-standard measurement tools (shoes, sticks, pool noodles, hands, feet, etc.). Point out to them why it is important that we all use the same tool to measure items. To add some creativity to your games, let them decorate their discus and cone with embellishments! Middle/Late Elementary: This age group could design a discus that they think would go the farthest. Have them start with a paper plate, but experiment with making adaptations to it. Would a smaller plate go further, would one with holes slow down? By this age, students should be getting comfortable using standard measurement. Pull out a tape measure and have them measure the distance to where their discus landed using customary and metric units. 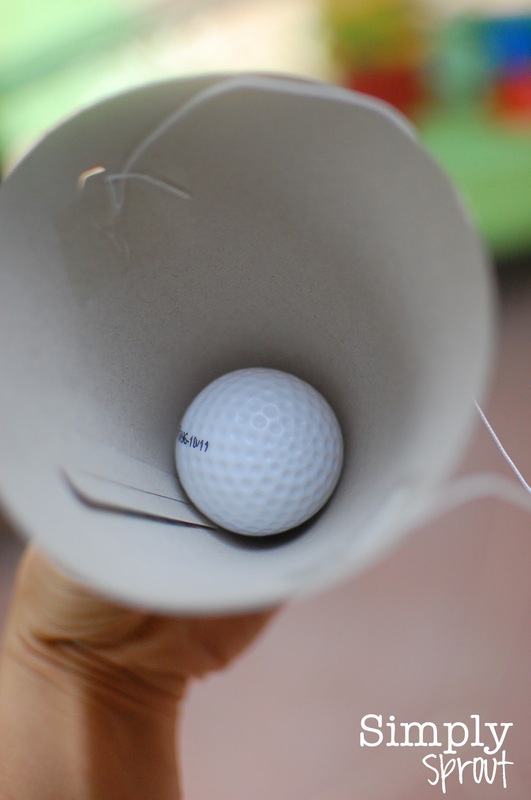 If the cone catch is too easy for the older ones, encourage them to find other house hold items to use in place of the cone to challenge themselves. 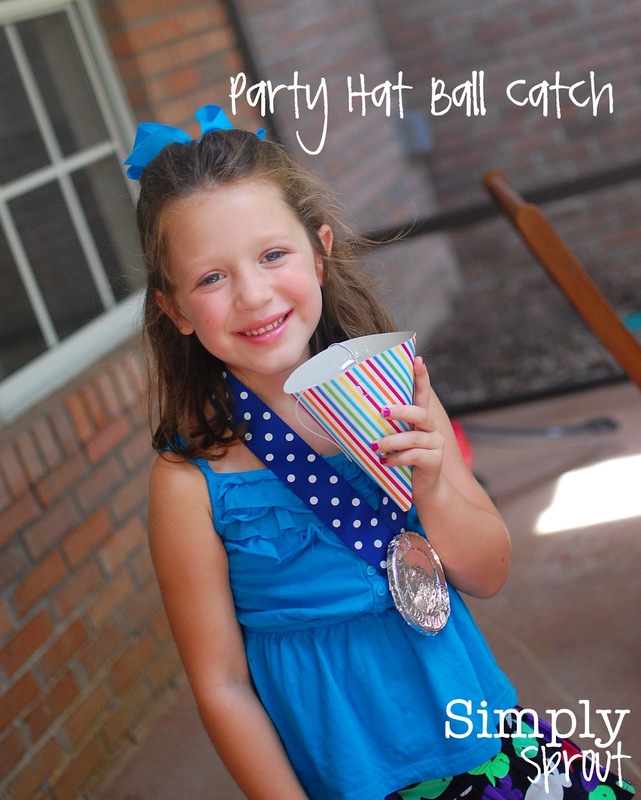 More fun Backyard Olympic games to come tomorrow!